ReCurrent II (c, 2017) evokes an internal activity in flux. Each print was made with packaging foam, its solarization dependent on my physical relationship to the developing image. ReCurrents (a-e) evoke an internal activity in constant flux. Each print was made with packaging foam, its solarization dependent on my physical relationship to the developing image. Silverscape I (2017) finds squares of silverleaf are captured midair as they sweep across the image plane. The squares themselves are odd, vulnerable forms, reflecting light and defining little but their own surface. Peak I (2017) is made from a window film made to guard against light and prying eyes. This material, normally flattened and seen through, suggests a distant, unknowable vista. Overlay I (2017) is a whisper of an image, suggestive of a watery surface, its surface is an impression made on a sheet of glassine that protected “ReCurrents” as the fiber silver gelatin paper was pressed flat. Reclaimed silver creates the mound at the base of Peak II (2017). The cast off material from the making of countless analog photographs, it is re-imaged, made of and from itself. Its title plays on multiple meanings; is it mountainous, peaking into the frame or prompting the act of looking? Leaf IV (triptych, 2016) evokes the terrain of an otherworldly landscape. A scanner amassed the image, built as light traced the surface of amassed silverleaves line by line. Blown (2016) sets leaves of silver in kinetic motion: flittering squares afloat in an ‘almost-dance’ forward and back again, resting occasionally on an absent surface that causes spatial uncertainty. Foiled II (2016) evokes a strange, ashen topography. It is composed of Cinefoil, broken and bent when used to obscure the camera and unwanted reflection in the making of Glistering. The surface of industrial material designed to cushion the flooring beneath us, Underlay II (2017) renders its machined banding visible across the image, giving way to what appears to be skin or bark. Fusings are solarized photograms made with safety glass that was repeatedly broken and flipped as the image was exposed. Trace ruptures in the surface of the image are visible, physical evidence of their making. 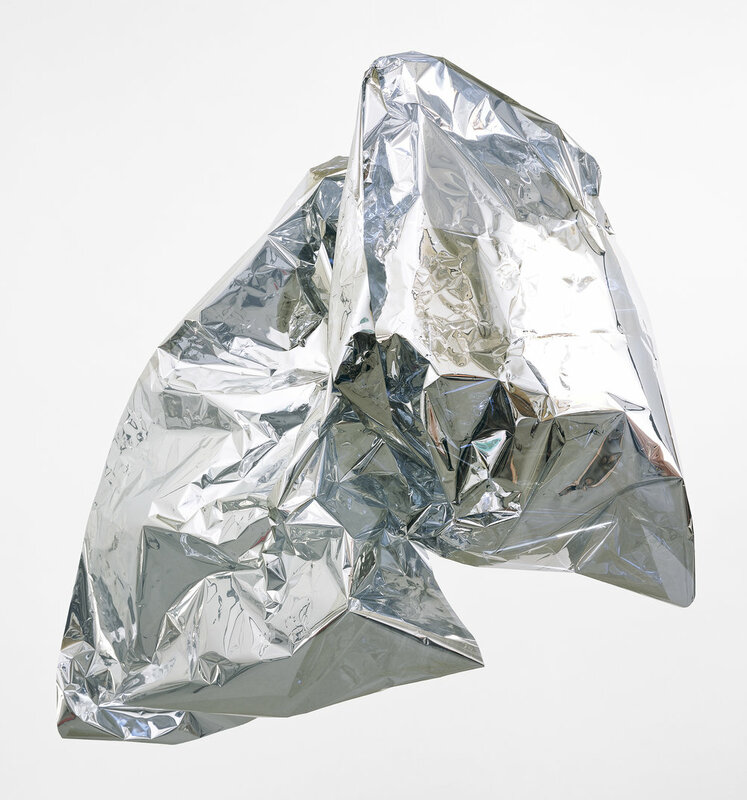 In Glistering I (2014) the sparkling surface of a pool of aluminum paint is activated by the environment in which it was made. The mundane activity of watching paint dry is transformed into something mesmerizing and magical. Reflect-ing I (2016) the apparatus of memory itself, my photographs act as indexes: documents of and from their own making, generated via an active process of transformation. 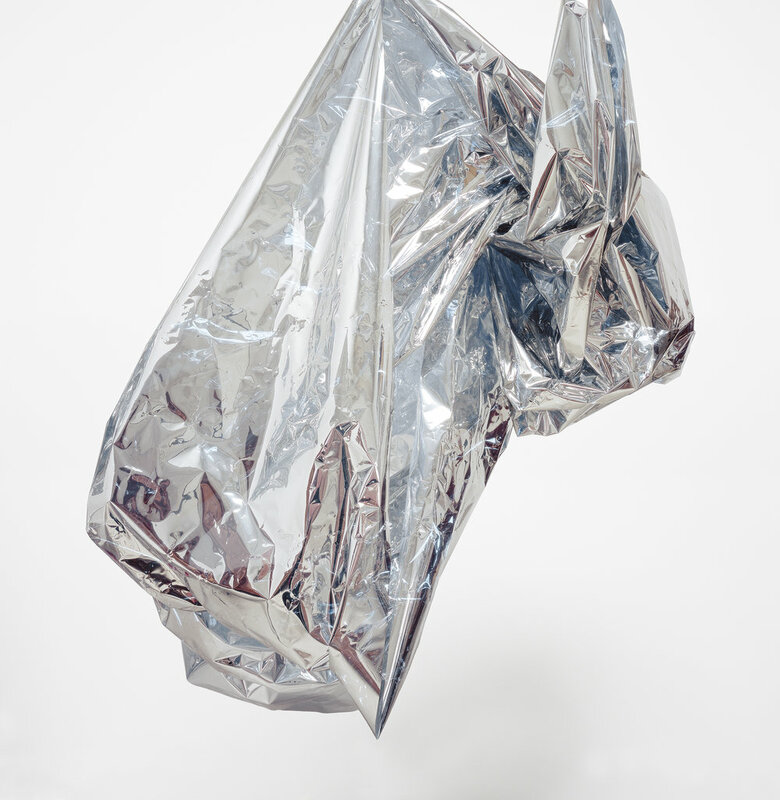 Foil III (2015) evokes the terrain of an otherworldly landscape. The scanner light that imaged its surface, traced through thousands of tiny glass beads, bouncing off of the aluminum foil substrate they're adhered to. The resulting surface reflects back on the scanner, evidence of its making in the tiny rainbowed glitches covering its surface. The bubbling and sparkling surface of a pool of aluminum paint is activated by manipulation from beneath. Plastic drop cloths are reformed into Casts plainly thrown into the image frame. This thin membrane usually lies in stasis to protect surfaces from accumulations over a span of time. In my hands, the material is animated, evoking the gesture of the hand that threw it. Stratum I (2016) suggests a clouded atmosphere; however, this large silver gelatin print of my studio wall and backdrop, covered in the reflective paint that composes Glistering, photographed just beyond focus. Screening III (2013) is in mesmerizing flux, its movement a response to its environment. The subtle twirl reflects the space outside the frame; every shift a record of its surroundings. Recollection III (2016) appear to be from or of the landscape. The material gathered is reclaimed silver, the cast off material from the making of countless analog photographs. These photographs are documents of and from their own making, generated via an active process of transformation. Screens are made from a window film made to guard against light and prying eyes. 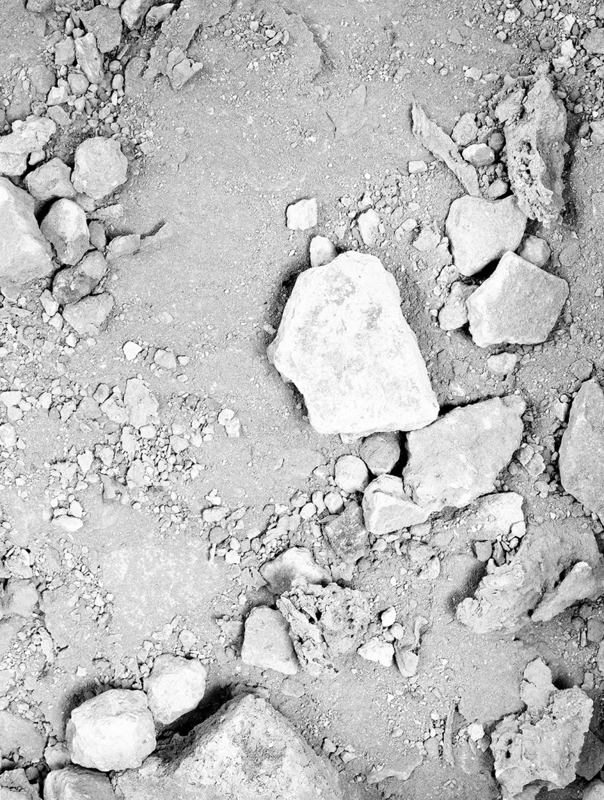 This material, normally flattened and seen through, is gathered up and suspended; the photograph reveals its surface to be resistant and permeable at once. In Luminous, a group of arts formally engage in various degrees with reflectivity, translucency, and whiteness are gathered. 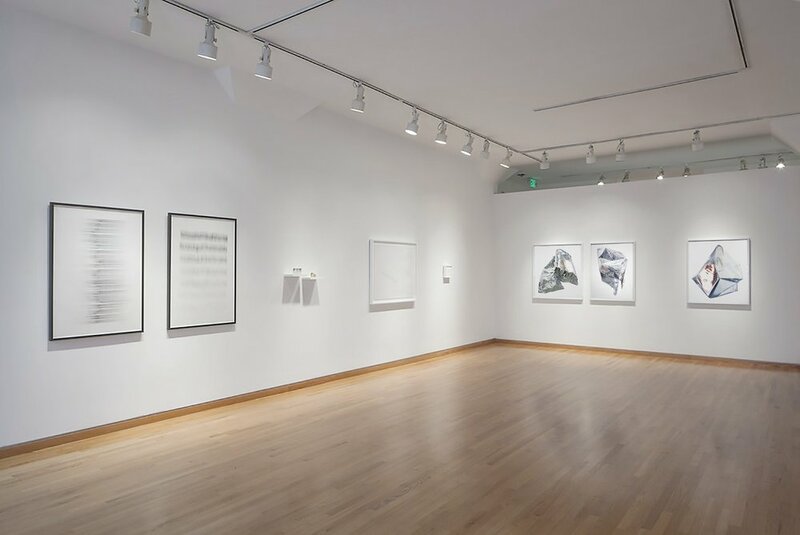 Each artist explores the multi-functionality of imagery through the absence of color as a way of examining the language of and crossover between abstraction and representation. I tend to materials that protect and repair to form new things from the existing. 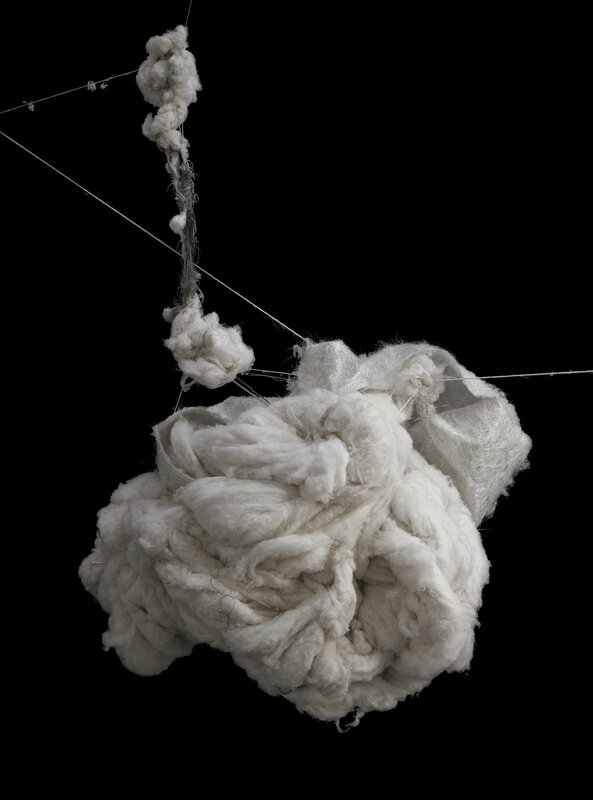 Accumulations, with their soft, absorbent bodies of fiberglass, batting and string hang suspended in emptiness. Each fugitive mass pulls against and is supported by the frame’s edge, visually activated and immobilized by the photograph at once. Knots are felt deep in the gut, secure one thing to another. These Knots were wound from scraps of window curtains and threads. 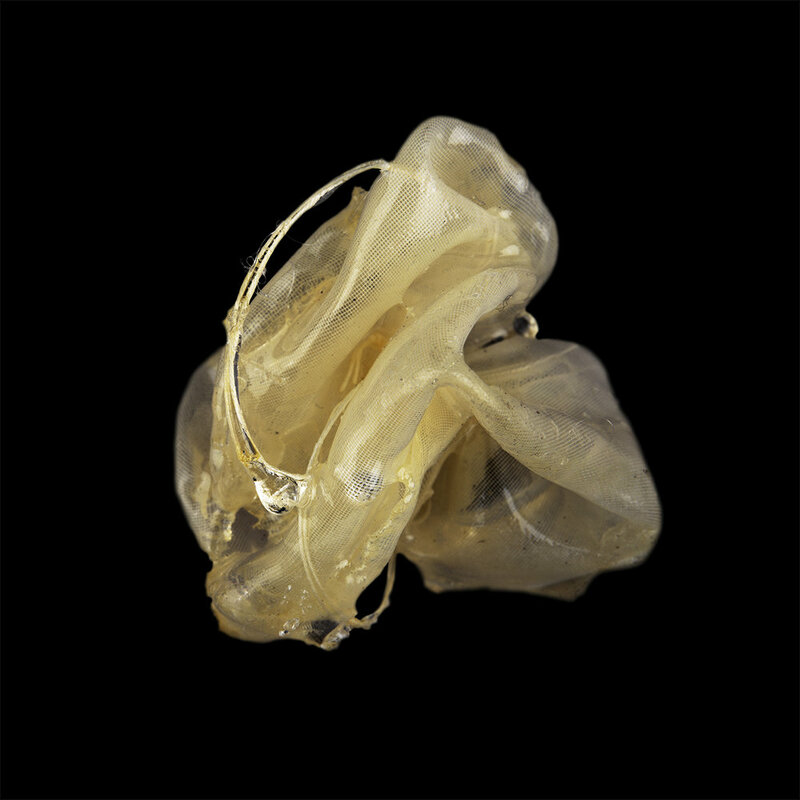 Each fibrous form was clumsily torn and patched together before it was encased in resin, the very stuff of memory.